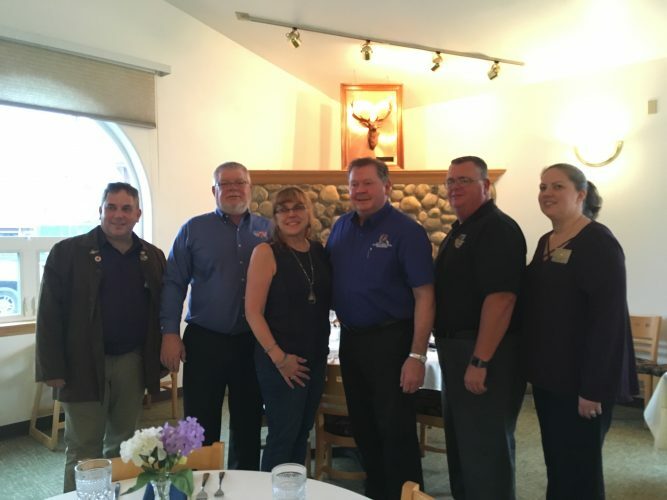 Mike Luhr (center) is the Elks Lodge’s first Alaskan national president, or grand exalted ruler. The Elks Lodge was founded in New York about 150 years ago as a social club. Its current grand exalted ruler, the guy in charge of it all, hails from Southeast Alaska. In Wrangell like most places, it’s The Elks or Elks Lodge. But the official name is The Benevolent and Protective Order of the Elks. Mike White heads Wrangell’s lodge. It has about 500 members. “I think in these bigger towns it’s easy to get lost. Just the way Alaska is being as small as we are. I think it just makes the Elks a little more relevant,” White said. It’s one of 16 lodges in Alaska. But there are thousands more spread across the country. Basically they’re bars, hang outs that do a lot of philanthropy. “When you see what the Elks are doing nationwide, it’s pretty cool,” said Mike Luhr, the Elks’ national president or grand exalted ruler. He’s from Petersburg and was elected at the Elks national convention this summer. Since then he’s scheduled 40 weeks of the year visiting Elks Lodges across the nation and closer to home in Wrangell. The Elks gets involved with charitable causes. Last year it raised $40,000 for a summer camp in Wasilla; airfare was provided for needy children. Alaska’s chapter also runs programs in drug awareness, funds scholarships and supports veterans. There are more than 780,000 Elk members nationwide. Luhr says the national lodge is always brainstorming how to get and keep more members. He says the lodge last year lost just over 1,000 members. So far this year, the lodge has initiated or reinstated more than 30,000 members. That’s something Luhr is proud of. He joined as a 21 year old. Since then he climbed the ladder at his lodge in Petersburg, then became Alaska president before achieving grand exalted ruler status – the first Alaskans to do so. “It’s an honor it’s a very humbling experience, I’ll tell you that, especially for a guy from Alaska. You get up on that stage in front of 8,000 people it is like holy cow,” he said. The Elks have a controversial past. It was founded as an all-white, all-male club. That didn’t begin to change until the 1970s. But women weren’t admitted until the 1990s.